Escape the worries of your day and watch your favorite sports game at All Sports Cafe, Inc. From delicious entrees and cold beer to live entertainment and games, our bar and grill has everything you need to relax and unwind from your day. We have TVs to catch your favorite games with NFL Ticket™ & ESPN™ College Game Plan during football and basketball seasons. 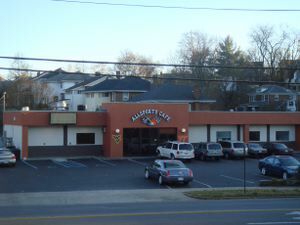 Stop by 1 of our 2 convenient locations in Roanoke and Salem for a delicious meal and sports entertainment. Contact us for additional information about our award-winning menu. Review: Great place for Karaoke on Friday night! Good singing and a fun crowd. Pat does a good job of keeping a good rotation so nobody waits too long. Buckeyes fans are always welcome! Love the food there! Best wings in town and the sandwiches are top-notch.